September has arrived and we’re now into the autumn season and whilst the weather in Cambridge has been less then desirable, at Angel + Blume we’re optimistic in the hope that we’ll be treated to a radiate Indian summer in the next few months (fingers crossed!) Following the Boy Scouts code to always ‘be prepared’ we’ve assembled a list of some beautiful accessories and furniture that are perfect for the changing seasons and the arrival of autumn. As ever Graham and Green have some wonderful products in their collection at the moment and they’re just the thing we’re looking for. These metallic tealight holders will reflect the flickering light from the candle flames and create a warm, cosy feeling. They’re perfect for using outside on the last few nights of summer and will be equally as good when brought inside. Pay tribute to the summer with this striking Peacock chair from Graham and Green. It would work both indoors and outdoors and makes for a great statement piece wherever you decide to put it. Or if you fancy something a little more retro in style try this vintage bamboo Rocker chair from Rockett St George. 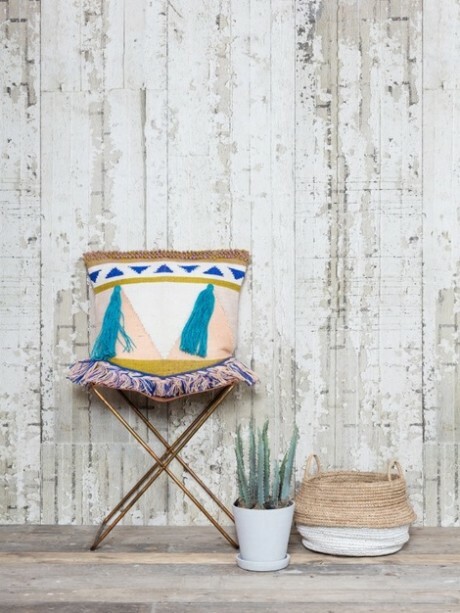 The addition of some Matthew Williamson fabric turns the chair from Granny chic to just plain chic! If your focus is something on the ground level take a look at some of these rugs and floor cushions. This gold Chevron cowhide rug will bring a little bit of sparkle to your home when the clouds are grey. The sporadic splatters and stripes of gold gives the rug a glamorous touch without being tacky and will make the room look shiny and new without adding anything else. These Moroccan tile mats from Graham and Green are the perfect combination of style and functionality. They’re ideal both indoors and outdoors and add a bit of style to an otherwise ordinary house product and will easily jazz up a neutral room. Or something a little softer perhaps? Try these gorgeous floor cushions also from Graham and Green. They’re perfect for taking outside and enjoying some sun and returning back inside and settling down in front of the fire for when the nights get a little cooler. If you’re not ready to embrace the oncoming autumn months and want to celebrate the summer in your interior decoration then have a look at some of these home accessories. This sunflower style wall clock makes both a stylish addition to any home as well as creating a warm, nostalgic memory for the summer months. Continue to feed your cravings of summer and make your house the home to something belonging in the scorching desert, this fantastically fun faux cactus. It’ll add intrigue to your home and be a fun, playful reminder of the sun and warm weather during the winter months, and it has the plus of having none of the prickly needles the real ones have! Another accessory I love are these beautiful yet simple placemats. They’re a simple added touch to a table that’ll brighten up your home as the autumn sets in, and are a contemporary take on the blue and white oriental style porcelain that was popular during the 17th century and onwards in Europe. So however the weather decides to behave in the next coming weeks, you’ll be prepared to enjoy it no matter what with these wonderful home accessories. Here in Angel + Blume, Autumn is one of the most exciting times of the year as it brings with it the launch of the new fabric, wallpaper, carpet, lighting and accessory collections. 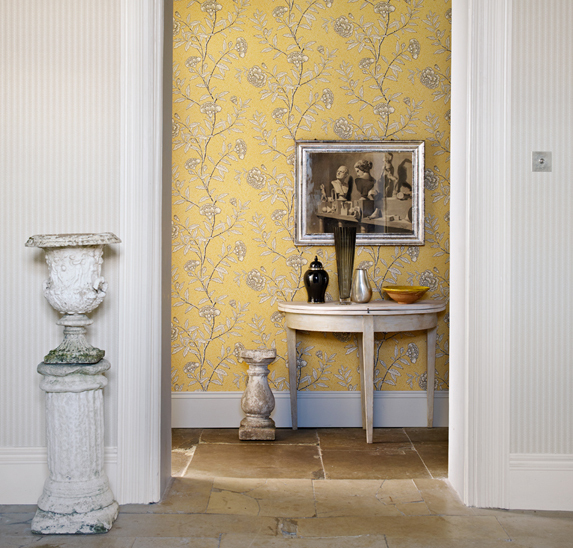 This autumn we are seeing a return of the wonderfully warm Chinese yellow so popular in the 1980s alongside bold overblown florals and small scale geometrics. together with cushions in Sancerre Lime and Lisanne from Harlequin’s Impasto Collection and in Nobilis gorgeous Hector fabric, and you would have a beautiful, up to date, not overly designed room scheme. Whilst yellow used with red and pink can look pretty and country, yellow teamed with Charcoal and Silver looks particularly smart and a bit more sophisticated. Again, this is illustrated particularly well in these lovely Harlequin Giverny curtains, which look as if they have been painted, and the really unusual coordinating People wallpaper. There would appear to have been a resurgence in period glamour with restrained Art Deco influences. And there is an abundance of metallic accessories from mirrors to lamp bases, to vases and even furniture.